In which I pretend to be a painter. 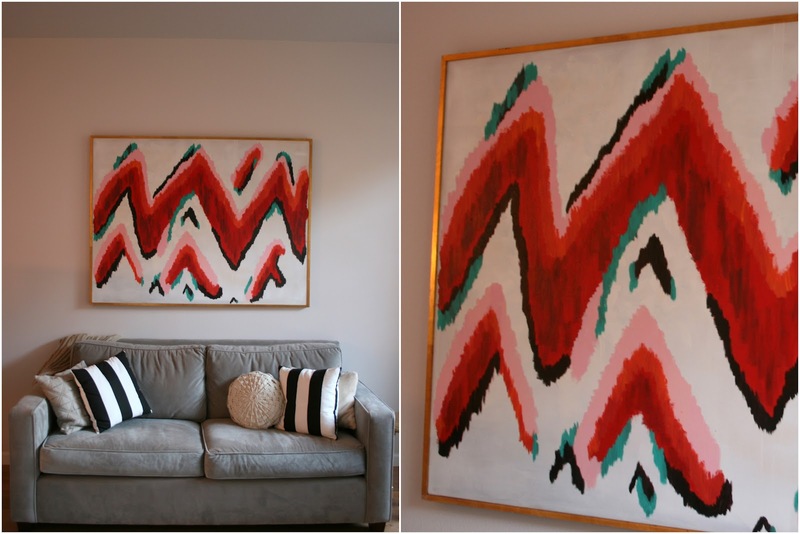 DIY zigzag ikat wall art! I pretended to be a painter for this DIY project... cuz I needed to! I was really hoping for a super large art piece to put above our couch, but didn't know what or what colors or where I would find it... so I decided I'd paint my own. 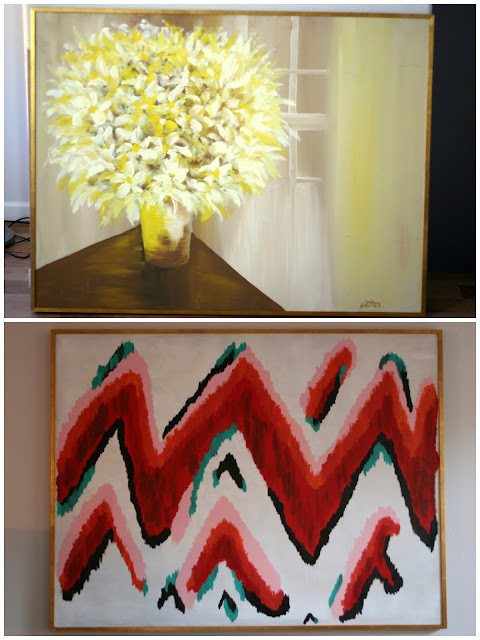 But large canvases are pretty expensive, so when I found this very odd but HUGE painting at Goodwill (half off! ), I picked it up and remade it. It was great to be able to pick the colors--although that was pretty hard, too. There's nothing else in the room to dictate the colors, so I could have picked anything! Aack, pressure! I did have the curtain fabric picked out, though (pics to come!)... but was also trying to make it less girly and more husband-friendly. I showed him some pictures of abstract art and pretty paintings, and he didn't like the really abstract ones; he liked the ones that had clear patterns or were clearly supposed to be something. So I did sort of a zigzag ikat-ey thing. Here it is above our couch. Hey, that looks pretty cool! I also wanted to say that I keep getting a McAfee "dangerous site" kinda warning when I stop by to check your blog - I don't know if it's just my laptop acting up or if you want to check out whether something nasty is infecting your site! Uh oh, how weird, I wonder why! Thanks for letting me know! It looks so great above your couch! WOW! The picture looks great above you sofa! I love it. LOVE. You did an amazing job! Colors are so pretty too. Looks great! I love the ikat pattern. And, the best thing about something like that... you get bored of it, you can repaint! Ooh lovely! And brilliant -- I have been getting a lot of crap from my co-workers for my office full of blank walls, and this might be the perfect approach for sprucing up my white room. I love this! Nice work. I'm trying to get more crafty myself! I am working on a Fall wreath currently. Great job! I love the size of this piece, it fills your wall nicely! Thanks! I looked at paint chips and tried to combine 3-4 of them till I got a palette I liked, then recreated it with acrylic paints. It was hard though, with almost no other colors decided! I think you just have to find something you love and decorate around that! Good luck moving!! I love this! I paint a lot and I'm always disappointed at how people think they need special skills to make art. I love how you just went for it and it turned out beautifully. You're an artist! So nice to hear that!! Thanks and thanks for sharing your pro perspective! Nice sharp colors. Great redo. Love it! You are so creative and talented! Congratulations!